Fred Krupp, president of the Environmental Defense Fund (EDF) sat down with Chevron’s Vice President of Policy and Planning Rhonda Zygocki on Monday at the Commonwealth Club in San Francisco to discuss, among other things, the recent boom in natural gas hydrofracking (or simply “fracking”). Declining natural gas prices and energy imports, increased job growth and – dare we say it – energy independence are all a part, according to Zygocki, of a new “energy renaissance” provided by natural gas now unleashed from its former shale prison, a renaissance that will spill over into the greater economy and light the path to the future. Calling for responsible development and strong regulation, Zygocki sees the coming century full of energy abundance and economic opportunity as the nation sits at a pivotal energy crossroads. There are undeniable benefits to shale gas, especially compared to coal, imported oil and most especially to the environmental catastrophe of the Alberta tar sands. But the rush headlong into full-scale shale fracking isn’t the quite the magic bullet Zygocki describes and ultimately not, as Fred Krupp argued, the best long-term energy solution nor without serious short-term risks to human health, ecosystems and climate. “There is no question that shale gas represents a big economic opportunity for this country,” Krupp said, “and has created a lot of jobs. 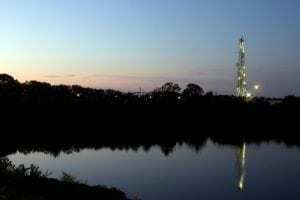 There’s also no question, if you visit the shale gas fields as I have, that there have been more than a few instances where people who live around these operations have been harmed,” citing one instance of a woman he met in Pennsylvania forced to abandon her family farm due to the noxious fumes from a nearby drilling operation. Another potential risk from natural gas production that has gained attention in recent months is fugitive methane emissions, or methane leakage. Natural gas is mostly methane, when it burns it produces less carbon emissions than other fossil fuels, offering a potential climate benefit by offsetting much more carbon intensive coal-fired energy production. But when uncombusted methane leaks from wells, pipelines and storage facilities, the resulting emissions of the gas can turn the potential climate positive into a climate negative. Methane doesn’t linger in the atmosphere like CO2, but has a much greater impact over short-term radiative forcing than does CO2. Over a 20-year span, one pound of methane is 72 times more potent than CO2 for increasing the retention of heat in the atmosphere. Obviously, reducing the amount of fugitive methane emissions is key to capturing the climate benefits natural gas could offer. Protect local communities from groundwater contamination, air pollution and other local impacts from drilling operations. The shale boom is on, and isn’t going away anytime soon, on that both the environmental advocate and energy executive agree. But turning the short-term economic benefits of shale gas production into a component leading to a long term strategy for a sustainable economic and energy future remain in question. And now is the time to address that question.